This reviewer and classic film comedy enthusiast used to love just about any Bob Hope comedy from the 1940s through early-‘60s, yet for reasons I can't quite put my finger on, nowadays find most of his comedies pretty tiresome. I still admire Hope's uncanny precision delivering comic dialogue, as well as for his physical agility as both a dancer and reactor to action around him, particularly for his comic posturing when frightened, cowardly retreating from danger, or lusting after a beautiful dame. (Woody Allen freely admits copying Hope's screen persona, and it's uncanny how exactingly he did so.) But Hope (and Crosby and Hope) pictures I once adored rarely do little for me now. A major exception is My Favorite Brunette (1947), a very funny spoof of the film noir/hard-boiled detective films then in vogue. That genre is perfectly suited for Hope's brand of humor, and the picture delights in unexpected ways, particularly the supporting performances of Peter Lorre and especially Lon Chaney, Jr. Both Chaney and Lorre spoofed their screen image in other movies, but here they get laughs all by themselves. Indeed, probably the single biggest laugh in My Favorite Brunette isn't a one-liner from Hope, but rather the simple sight of Lon Chaney enthusiastically blinking. The picture turned up on television a lot after 1975, after it fell into the public domain when its copyright wasn't properly renewed. It's now part of a four-film package of restored Hope titles from Kino, all of which look great. San Francisco baby photographer Ronnie Jackson (Hope) is on death row awaiting execution following a first-degree murder conviction. The warden allows Jackson to tell reporters (in flashback) how he got there. Jackson dreams of becoming a private eye like his idol, office neighbor Sam McCloud (Alan Ladd in an amusing, unbilled cameo). When McCloud is out of town, mysterious beauty Carlotta Montay (Dorothy Lamour) mistakes Jackson for the detective, urging him to investigate the kidnapping of her husband (later uncle), wheelchair-bound Baron Montay (Frank Puglia). At the palatial, seaside mansion of Kentucky colonel-like Major Simon Montague (Charles Dingle), the Baron's former business partner, it's suggested that Carlotta is suffering from delusions, producing as evidence Baron Montay, obviously not kidnapped. But later Jackson, peering through a window, sees the Baron up and about, joking about something sinister with Montague and his henchman, including Dr. Lundau (John Hoyt) and assassin Kismet (Peter Lorre), whom Jackson despairingly calls "Cuddles." The story gets Big Sleep-level confusing, but Jackson and Carlotta are eventually imprisoned in Montague's sanatorium, where another henchman, dimwitted hospital orderly Willie (Lon Chaney Jr.) guards them. Dr. Lundau: For the past six months, Miss Montay has been suffering from an acute form of schizophrenia, accompanied by visual aberrations and increasingly severe paranoiac delusions. Ronnie Jackson: Mm-HMM! And how is she mentally? Lamour's classical noir leading lady and the cinematography all accurately echo the look and feel of late ‘40s noir. But even better is the fun of watching Lorre and Chaney. Lorre has one particularly memorable scene where he's trying to plant a false clue for Jackson to find while searching a room. Timed to perfection and nicely punctuated by Robert Emmett Dolan's musical score, Kismet keeps placing the "clue" right where Jackson can find it, but he stubbornly refuses to spot it. Chaney, meanwhile, performs a variation of his first signature role as Lennie in Of Mice and Men, the good-natured dimwit, who here delights in cracking walnuts with his big muscles. He's so funny and sweet Chaney actually becomes endearing, rare for this sort of comedy. In black-and-white, My Favorite Brunette has a nice, film-like grain, good blacks, and a solid, steady image with few signs of damage or age-related wear. The mono audio is strong throughout on this region "A" disc. 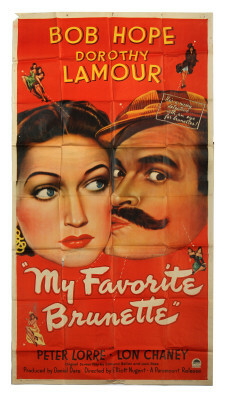 A Bob Hope comedy that still holds up to entertain young and older audiences alike, My Favorite Brunette is Highly Recommended.